Hello all and welcome to Neat & Tangled Release Week. Today is Day 3 and we are introducing two stamp sets, one 6×8 set – Christmas Journaling and a 4×6 set called Bright Baubles (with matching dies). 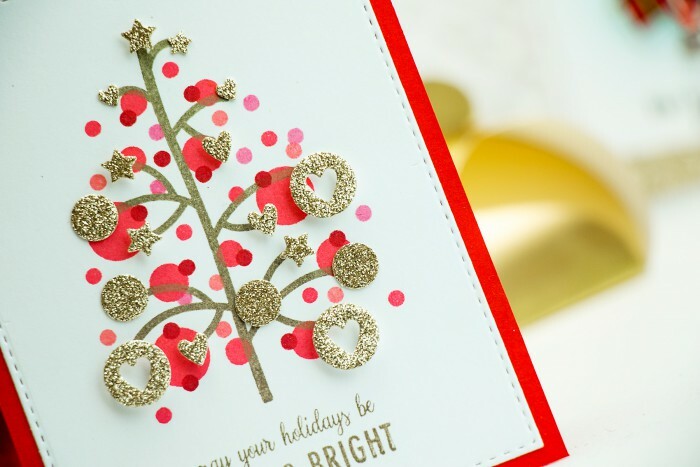 I’m sharing a project using Bright Baubles set and dies. I started by stamping the tree base and branches using Tsukineko Vintage Sepia ink, its a nice soft brown color. Next I die cut a bunch of hearts, circles and stars out of gold glitter paper and arranged them on my stamped image. Seeing where I needed to add additional images I stamped circles in various sizes using lots of shades of pinks and reds. Next I die cut the panel using Simon’s Stitched Rectangle die and adhered my glitter shapes, most of them were foam mounted, some smaller pieces adhered using glue. Finally I stamped a sentiment using the same Vintage Sepia ink and adhered my panel onto a red card base. Absolutely gorgeous! I just love the sparkly baubles! This is such a pretty card Yana. I am really loving these new sets! Saw it on Instagram and gasped. So cool! Amazing card! 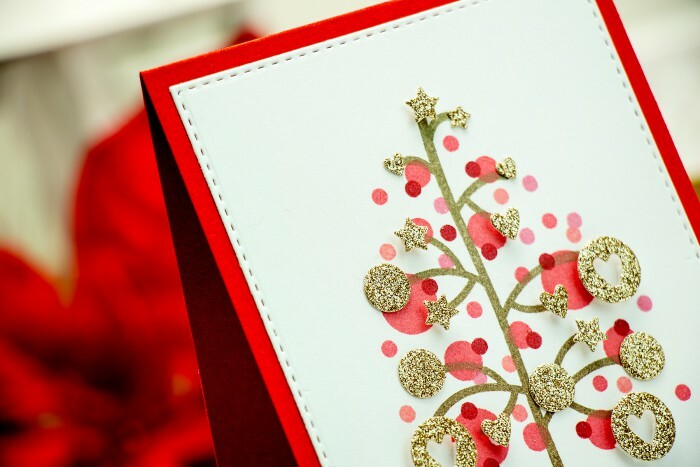 ADORE your GORGEOUS tree, colours and SPARKLE – WOW – a STUNNING design – LOVE IT ALL!!! Oh wow, this looks amazing. I think I need to CASE this card. I didn’t know this set was being released already. I have just posted my first card using this set from Catherine Pooler’s SOA box.